Preheat oven to 400 degrees. Place tomatoes with their liquid in medium bowl. Add stuffing mix, water and garlic; stir until stuffing mix is moistened. Set aside. 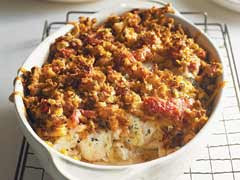 Place chicken in 9x13 baking dish; sprinkle with basil and cheese. Top with the stuffing mixture. Recipe from The Kraft Food & Family Magazine. This doesn't seem like it would freeze very well. How did it turn out?